EllieRaine: Fingerless Mitts Part 2 and Done! Fingerless Mitts Part 2 and Done! Finally finished. Need to take a better picture though. So pleased with the finished result. Definitely want to make some more. It's been so cold here in the UK these past few weeks & I was able to wear these & my new scarf. They kept my hands so toasty warm! PS. You might notice the left glove seems wider than the right. That's because when it was finished, every member of my family wanted to try it on LOL! Hi I'm Ellie and welcome to my little corner of the web. I'm a Wife and Mum of 2 grown up Daughters, one who has recently flown the nest. I've suffered with CFS for a number of years and my health isn't too great. 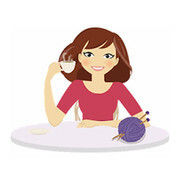 But when I am feeling good I love to knit, crochet, read and watch movies. You'll often find me sat in my comfy chair, with a hot mug of coffee while I plan my next project. Where you can find me. All images belong to EllieRaine unless otherwise stated... Simple theme. Powered by Blogger.